2018 FIFA World Cup Russia is the 21st Fifa Football Worldcup, which will be consist of 36 matches with 32 teams. 2018 FIFA World Cup Russia will be held in Russia on 14 June 2018. It is the first Fifa World Cup which will be held in Europe after 2016. There will be 32 teams which are qualified where 31 teams played the qualifying matches and the host Russia was automatically selected as a qualified team. There are lots of big teams couldn’t make it qualify such as Italy and Netherlands, and there are two teams will play the Fifa World Cup for the first time one is Iceland and second is Panama. Here in this post, we are going to share the complete list of qualifying teams, and their groups, also you will find the complete matches and schedule with time and venus. So, let’s get started. These are the teams which are qualified to play the 2018 FIFA World Cup Russia. There are 31 teams which played the qualifying matches and the host Russia was automatically qualified. The draw of Fifa World Cup 2018 was held on 1st December in Moscow at State Kremlin Palace. The team was drawn in 4 pots according to Fifa ranking from October 2017. In the draw process, the Russia who is the host was automatically selected as the highest ranking team. Here is a list of the draw of 32 teams according to rankings of Fifa. The 2018 FIFA World Cup Russia divided into 8 groups. Each group have 4 teams. Here is a complete list of 2018 FIFA World Cup Russia Groups. 2018 FIFA World Cup Russia schedule is finally announced and the event will start from 14th of June 2018. The first match will be held in Moscow Luzhniki Stadium between Russia and Saudi Arabia. There will be 40 Group stage matches, 8 Last 16 matches, 4 Quater Finals, 2 Semi-Finals, 1 Third-Place playoff match. The final match of 2018 FIFA World Cup Russia will be held on 15th of June 2018 in Moscow Luzhniki Stadium. Let’s check out the matches schedules below. 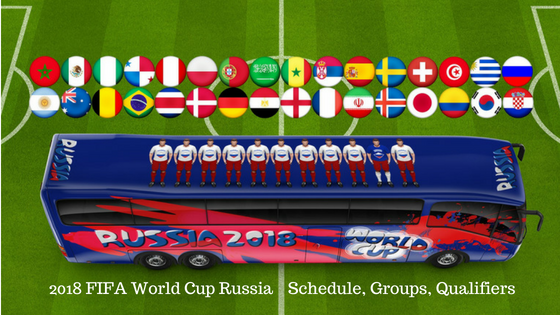 So it was the complete details of 2018 FIFA World Cup Russia which we tried to put on one place. Are you a fan of football in Pakistan? who is your favourite team in 2018 FIFA World Cup Russia? If you think we have missed any information about 2018 FIFA World Cup Russia then please do let us know in the comment below.